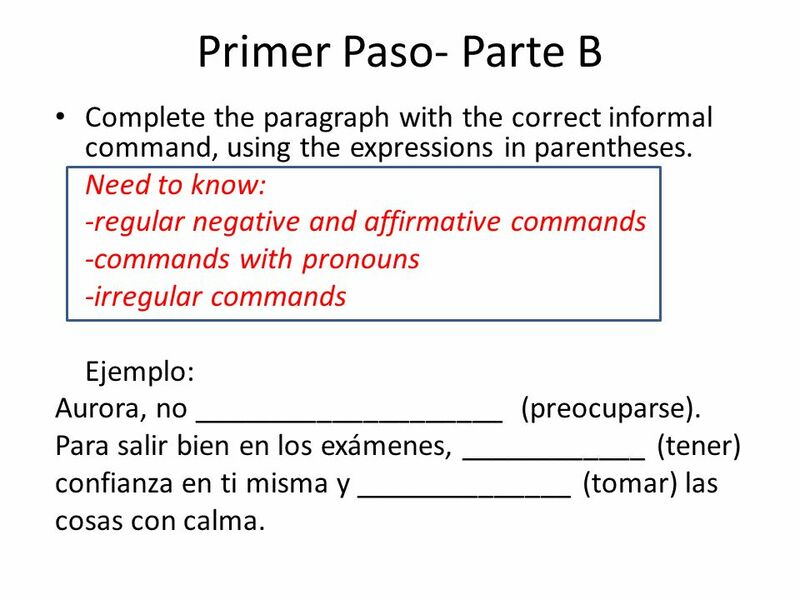 3 Primer Paso- Parte B Complete the paragraph with the correct informal command, using the expressions in parentheses. 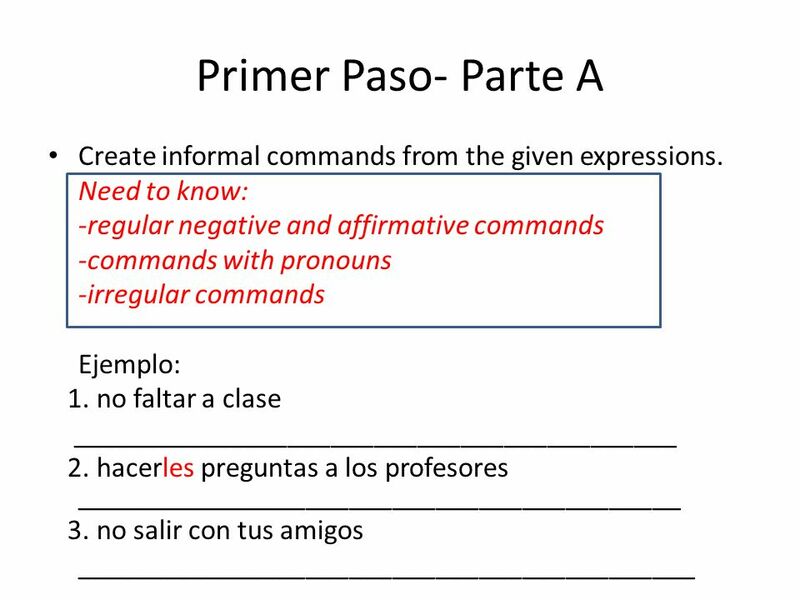 Need to know: -regular negative and affirmative commands -commands with pronouns -irregular commands Ejemplo: Aurora, no ____________________ (preocuparse). Para salir bien en los exámenes, ____________ (tener) confianza en ti misma y ______________ (tomar) las cosas con calma. 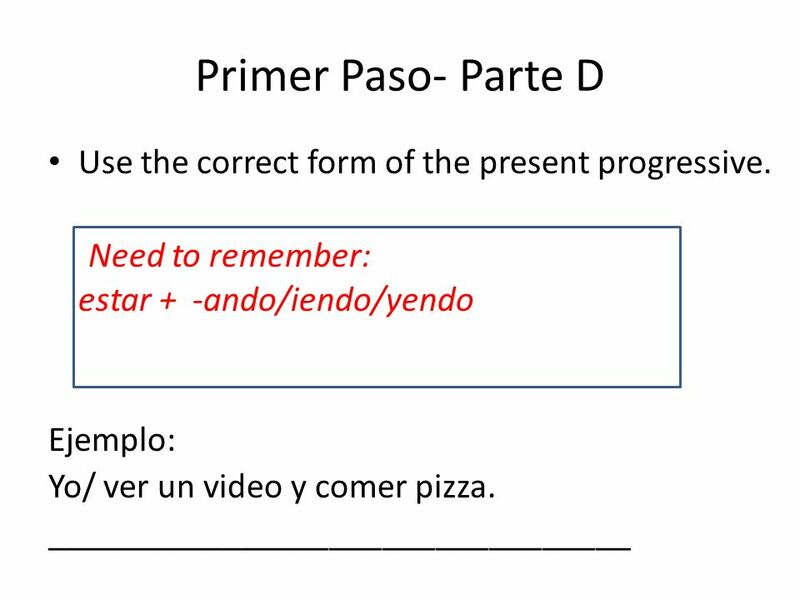 5 Primer Paso- Parte D Use the correct form of the present progressive. 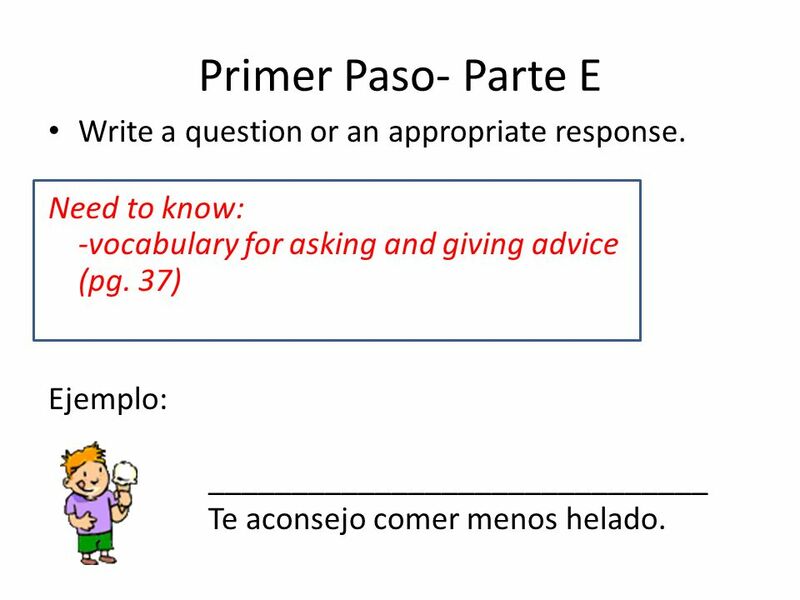 6 Primer Paso- Parte E Write a question or an appropriate response. Need to know: -vocabulary for asking and giving advice (pg. 37) Ejemplo: ______________________________ Te aconsejo comer menos helado. 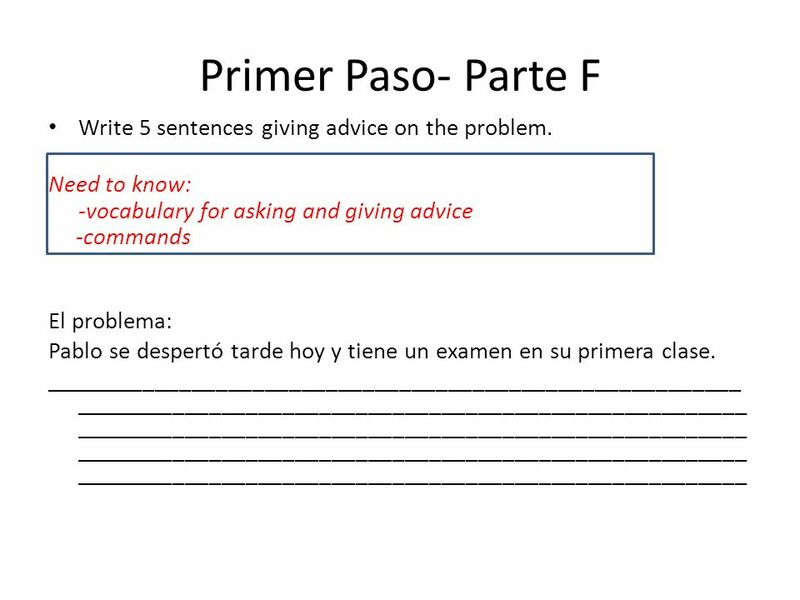 7 Primer Paso- Parte F Write 5 sentences giving advice on the problem. 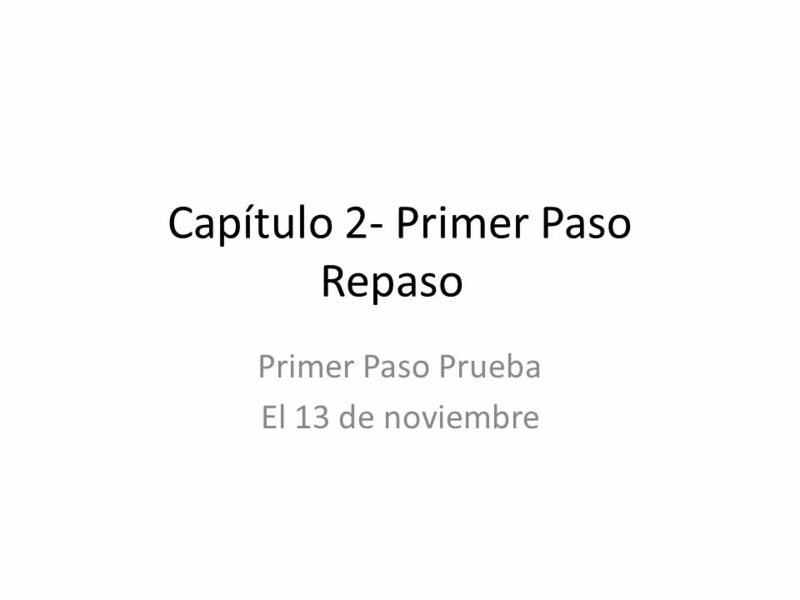 Descargar ppt "Capítulo 2- Primer Paso Repaso"
Affirmative Tú Commands n You already know how to give affirmative commands to someone you address as tú. n You take the 3rd person form of the verb. Affirmative Tú Commands P. 45 Affirmative Tú Commands n You already know how to give affirmative commands to someone you address as tú. n You take the. En el futuro Translate the following into English: 1.Voy a dormir 2.Vamos a salir 3.Vas a comer jueves, el diecisiete de noviembre. Cap. 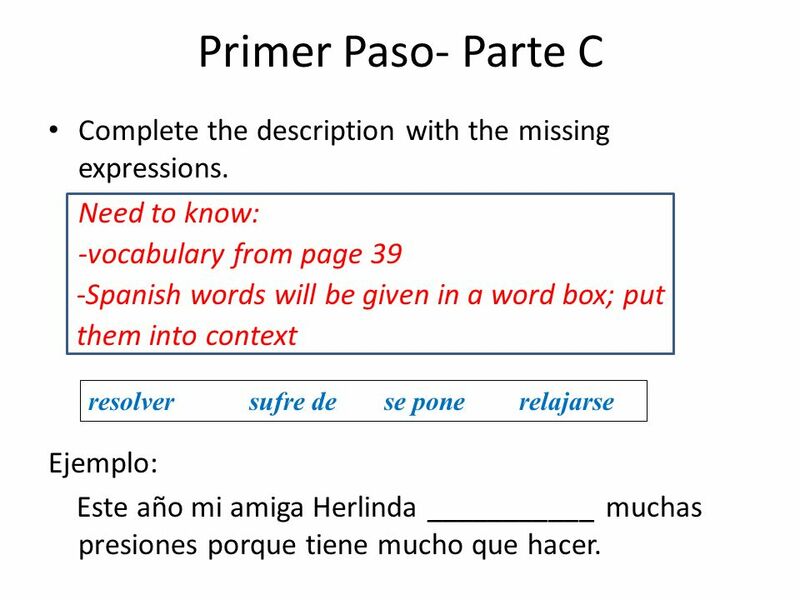 2- Segundo Paso Quiz Outline. Segundo Paso- Parte A You will be given a calendar. And you will need to describe the dates shown in relation to the. Affirmative Tú Commands n You already know how to give affirmative commands to someone you address as tú.